Compliment your style with some sparkle with these luxurious flower cluster diamond stud earrings. Styled in stunning 9 carat yellow gold and adorned with 1/5 carat of diamonds in a flower cluster design, these gorgeous earrings offer a combination of elegance and class while still adding a unique touch to any fashion. 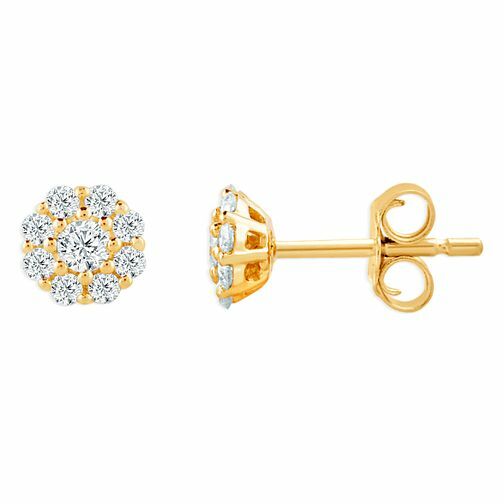 These diamond earrings are the perfect accessory to bring glam to any look. 9ct Yellow Gold 1/5ct Diamond Flower Cluster Stud Earrings is rated 4.0 out of 5 by 1. Rated 4 out of 5 by Anonymous from Delicate and beautiful design I liked this product because of its delicate design and beautiful looks. It goes really well with ethnic and modern outfits.